K. Byrappa, Vice-Chancellor of Mangaluru University, speaking at a seminar organised by the Media Alumni Association of Mangalagangotri in Mangaluru. 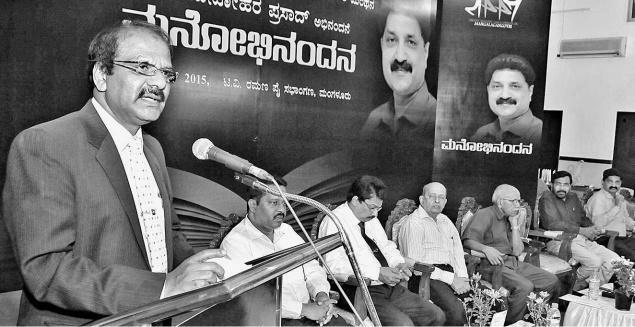 Mangalore University is planning to adopt some villages for carrying out sector-specific studies and providing guidance for development, its Vice-Chancellor K. Byrappa said here on Sunday. Replying to questions at a discussion on ‘Contributions of Mangalore University in Regional Development’, organised by Media Alumni Association of Mangalagangotri, the Vice-Chancellor said that the villages would be selected in Dakshina Kannada, Udupi and Kodagu districts, the jurisdiction of the University. “It is my dream,” the Vice-Chancellor said. He said that final semester students doing project works would be directed to visit such villages and submit study-based project works after identifying the issues. Mr. Byrappa said that the University would ensure that more than 100 foreign students studied in its campus from the academic year 2015-16. He said that the University would release its vision 2030 document on its foundation day on September 10 this year. The document would be prepared in consultation with experts in different sectors across the country. B.M. Hegde, the former Vice-Chancellor, of the erstwhile Manipal Academy of Higher Education (now Manipal University), said that government control over universities should go and there should be autonomy to impart quality education. “Now universities have become agents of the government,” he said, adding that the government should stop nominating its members (political appointments) to academic councils and syndicates of the university and instead should allow the university to select the members from among experts. Sripati Tantri, a former member of the Syndicate of the University, said that the University should introspect on whether it was imparting quality education. 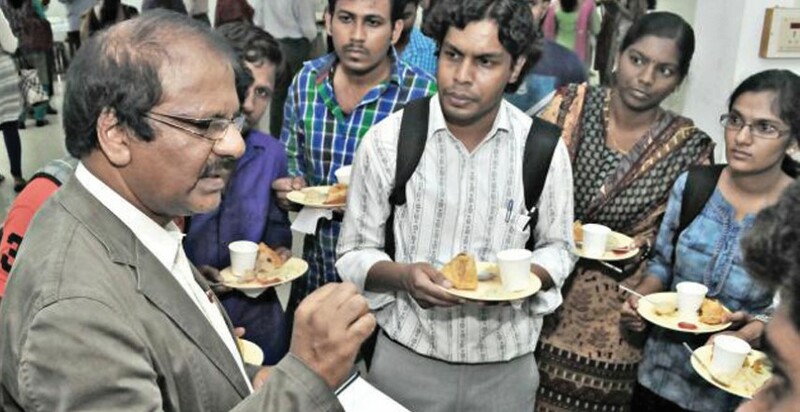 K. Chinnappa Gowda, a professor of Kannada and the former Registrar (administration) of the University, said that the University in all these years has been able to identify traditional knowledge system of the region and foster it. P.S. Yadapadithaya, Registrar (administration), said that the university would shortly organise an open house to showcase its strength. Earlier, Manohar Prasad was felicitated on the occasion for his three decades of service as a journalist. After felicitating him, the Vice-Chancellor announced that the University would appoint him as an adjunct professor at the university. Mangalore University will have a single entry point to its campus after 7 p.m. after some months, said Vice-Chancellor K Byrappa. At a function here on Sunday he said that it would be done for security purposes. The university is now taking steps for making a single entry point as researchers and students would be studying late in the night. Scholar Amrut Someshwar being felicitated with the Kannada Sahitya Parishat centenary award in Mangaluru on Thursday. Vice-Chancellor of Mangalore University K. Byrappa said on Thursday that there is a need to translate the works of scholar Amrut Someshwar in to other languages. He was addressing a gathering at a function organised by Halasangi Geleyara Prathisthana, Vijayapura and the Kannada Sahitya Parishat at the residence of Mr. Someshwar. Mr. Byrappa said that the S.V. Parameshwara Bhatta Institute of Kannada Studies at the university could organise a series of lectures on the works of Mr. Someshwar. In addition, a study chair after him could be opened. 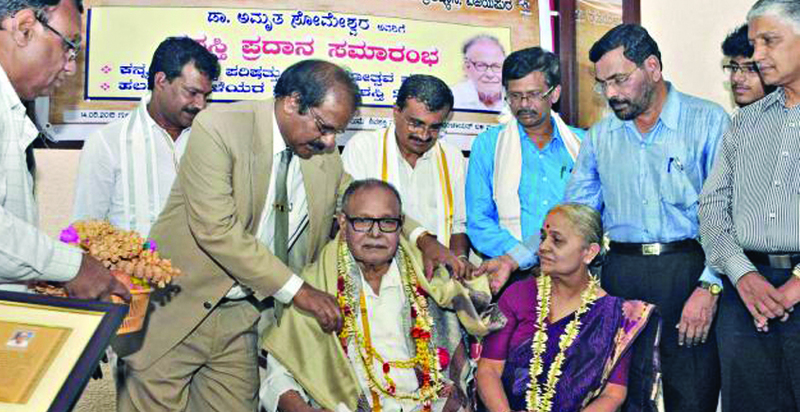 The 80-year-old Mr. Someshwar was felicitated for his contribution to Kannada and Tulu literature. K. Chinnappa Gowda, a professor of Kannada at Mangalore, said that Tulu Samputa, Yakshagana Samputa, and Paddana Samputa of Mr. Someshwar deserved the Kendra Sahitya Academy Award. The prathisthana presented him a cash award of Rs. 51,000, a memento and a citation. Kannada Sahitya Parishat also presented him a memento by presenting its centenary award. Mangalore University Vice-Chancellor K. Byrappa interacting with students and staff during a felicitation programme at Mangala Auditorium, Konaje, in Mangaluru, on Wednesday. Students intending to pursue postgraduate courses on the Mangalore University campus or on the postgraduate campuses in Chikkalvaru and Madikeri can now apply online. Starting this academic year, the university will allow online filing of applications. Speaking at a felicitation programme for the teaching and non-teaching staff of the university, Vice-Chancellor K. Byrappa said this was part of the work taken up to digitalise the whole process – starting from admission to issuance of marks cards. “Work is at an advanced stage and it will be in force from this academic year,” he said. Prof. Byrappa said students could submit their applications and details online and then physically submit the copies of the documents for verification. The online system of admission will be adopted at the affiliated colleges at a later stage. Students on the university campuses will be issued smart cards, which could be used at information kiosks to get information such as attendance and fees. Three such kiosks would be established soon, the Vice-Chancellor said. The university was also moving towards making its campus more secure for students by permitting vehicles only through one entrance after 7 p.m., he said. A security personnel will be placed at this gate to allow vehicles inside only after noting the vehicle numbers. Sensor-enabled street lights, which will be on as long as a student is on the road, and close circuit cameras were being installed on the roads. “With this a student can walk at anytime in the night on the campus,” he said, and added that this would be ready in another six weeks. The varsity also plans to upgrade facilities at its Mangala and other auditoriums to world-class. Different departments of the university also plan to adopt the nearby villages and conduct studies on various issues.